It wasn’t the easiest of win for the Red Devils but a solitary strike from French winger, Anthony Martial in the second half was enough to secure all three points for the 20-time Premier League champions away at the Turf Moor. French international, Anthony Martial helped United to our fourth straight win in all competitions since the 0-0 draw against Southampton at Old Trafford and it was also the first time the Frenchman would score in three successive Premier League games having scored against Everton, Stoke City and Burnley. Although, it was cagey first half from both sides as neither didn’t give too much away but United came close in the 42nd minute via Ashley Young having nutmegged Gudmundsson before curling his shot wide of the post. Meanwhile, in the 54th minute a fine link-up play from Belgian striker, Romelu Lukaku was enough to setup Anthony Martial to score his tenth goal of the season. The Claret could have restored parity in the 57th minute after Juan Mata brought down Ashley Barnes outside the Red Devils box but a direct free-kick from Ben Gudmudsson hammers off the crossbar. However, Anthony Martial could have put the game to bed in the 88th minute but a great save from Nick Pope denied the Frenchman from scoring a brace. Martial is far better than Rashford.. English Press act like they do not know this.. #mufc. Anthony Martial is the best finisher at the club. 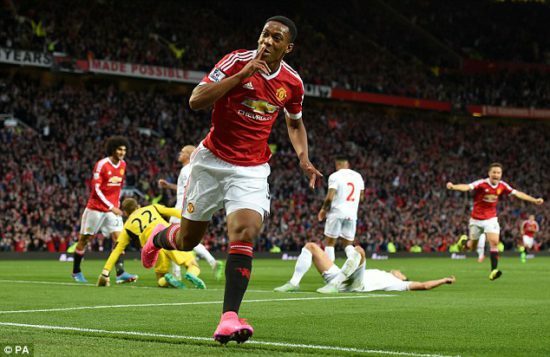 Anthony Martial got 11 goals and 9 assists. Been unreal this season. The 22-year-old who has been sensational for United so far this season but was particularly impressive against the Clarets having completed 85% of his passes, created 3 chances, had 2 shots on target and scored the only goal of the match. The Frenchman has been touted as the man to give way for Alexis Sanchez in the Manchester United first eleven, but with this kind of form Mourinho may find a way to play them together.